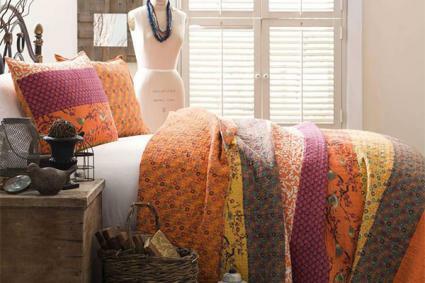 Bedding bargains are found at both brick and mortar stores offering website sales for convenience and additional savings, along with online-only retailers. You can find great deals if you're willing to browse before making your final purchases. LinenSource® was founded in 1991 as a catalog company offering its brand of quality discounted bedding. 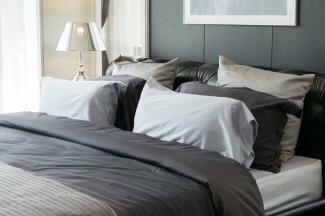 You can purchase sheet sets or individual pieces, such as a fitted sheet, flat sheet or pillowcase. Some of the pillowcases are sold in sets of two. Other bedding items include, quilts, comforters, bedspreads, coverlets, duvets, blankets, throws and many other top covers. Bed pillows, mattress toppers and bed skirts are also found in a nice variety of styles and colors. The website offers great prices on discounted bedding selections, but there are even greater savings to be found in the Outlet section. The bedding featured in this section is further discounted with up to 75% off the original price. The website has regular promotions, such as an additional 30% discount on all the Outlet products. Register to receive notifications about the latest promotions. Another added benefit is the company's 100% guarantee for customer satisfaction. Purchased items can be returned within 90 days of receipt. You can elect to either receive a refund or an exchange. For customers' convenience, a FedEx return label can be found in the shipping package. The return charge is $9.95. If you qualify, you can receive a LinenSource credit card. LinenSource credit cards can be used for any of the other 12 stores within the Blair group. Some of the money-saving perks of the card include rewards given for every $150 spent, a birthday discount of 25% and new cardholder coupons. Overall, LinenSource customers are satisfied with the quality and savings of their purchases. 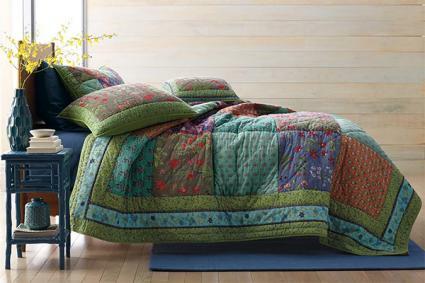 Comments include, "I'm very happy with it", "This bedspread is beautiful! ", and "Very pleased with the product." The sheet sets can be searched according to fabric type, mattress size, water bed, Olympic queen, twin xl split king, and California king. The website doesn't offer customer review capabilities, however. Overstock is known for its bargains in well-known brands, such as Eddie Bauer, Grand Hotel, Tommy Bahama and Affinity Home Collection that are overstocks, buyouts, overruns, liquidations and discontinued products. The bedding and bath store section features bedding sheets, comforters, coverlets, duvet covers, blankets throws, down bedding, memory foam mattresses, mattress padding and toppers, quilts & bedspread, down alternatives and kids & teens bedding and more. The savings range from 30% to 60%+. Several bedding guides are provided to assist customers in making appropriate choices based on their needs. These guides include bedding tips, blankets, sheets, mattresses, memory foam, textiles, pillows and more. Customers can create various wish lists. Rewards O allows customers to earn back 5% of the purchase that can be redeemed toward purchases. Other benefits include, exclusive email & early access to promotions, free shipping on all orders, you never have to pay extra and Club Gold members can earn up to 40% back on special items. Standard free shipping for orders $45+ and ships within 1-2 business days. Sign up and receive email notifications of flash sales, clearance and liquidation sales and other promotional events. Give Back Box program lets customers fill a box with clothing or household items for a donation to Goodwill®. You can then print the online free UPS label to attach to your box. Simply take the box to a UPS store or drop-off site and Overstock delivers your donation for free. If you qualify, you can take advantage of extra savings by using your Overstock credit card. Save money by earning between 1 and 8 percent in qualifying Club O Rewards, among other advantages. Overall, Overstock customers are pleased with their purchases and customer service. Some comments include, "This is my first oversized bedspread and not my last. It looks great," ""Exactly as pictured, soft, washable, oversized," "Very happy with purchase," and "The bottom fitted sheet fits perfectly! Loved them so much I got another pair!" The Company Store features a Bedding Clearance section that changes often, so you need to visit often to catch some of the great deals. You can sign up for email notifications of sales and promos as well. Some of the offerings include comforters, sheets, shams, throws, duvets, quilts and other bedding, such as pillows. You can find brand names such as St. Tropez®, LaCrosse®, PrimaLoft®, Legends® and others that reflect the stylish quality offered at a savings that can be as much as 60% off the original price. Gift cards and E-gift cards are available. Basic bedding guide full of helpful tips, information, down information and bedding sizes. Monogramming is available on many bedding products. Orders over $500 require a signature upon delivery that's typically shipped via United States Postal Service (USPS) within 7-10 business days after placing your order. Express, 2nd day and Overnight deliveries are available for additional fees. If you qualify, you can receive The Company Store credit card to use for your purchases. By having it, you'll receive free delivery on your next purchase and get access to exclusive card member offers and discounts. There are several bedding name brands carried by equally well-known retailers that customers can depend on for inexpensive quality bedding choices. Mainstays: This brand is known for its bed-in-a-bag adult and children's bedding as well as comforter sets, quilts, blankets, sheets and mattress pads for adults and children. You can find this bedding at Walmart. Cannon: This brand features sheets, bedspreads, mattress pads, comforters, pillows and other bedding options. You can find these at Sears and Kmart. Colormate: This brand offers sheets, comforters, completed bedding sets and bed pillows that can be found at Sears and Kmart. Better Homes and Gardens: An instantly recognizable name of quality, Better Homes and Gardens bedding is available in comforter, quilt, duvet and sheet sets and is sold at Walmart. There are many ways to find bargains every day for bedding. Search coupon sites like RetailMeNot for special bedding coupons. Sign up for website newsletters for special promotions, sales, liquidations and closeouts. Set a Google word search notification that will automatically send you an emails for an alert based on the words you enter. Browse websites like eBay and Etsy for new bargains. Follow favorite bedding companies and bed linen retailers on Twitter, Facebook, Instagram and other social media outlets. Visit local bedding stores and sign up for specific location notifications of sales and other promotional events. When you find a bargain buy, don't wait to make your purchase or you may miss out on the product, especially if the item has a steep discount. Other shoppers may be eyeing the same item you've been coveting before it was marked down. If you take your time and research, you can find your ideal bedding with a great savings.